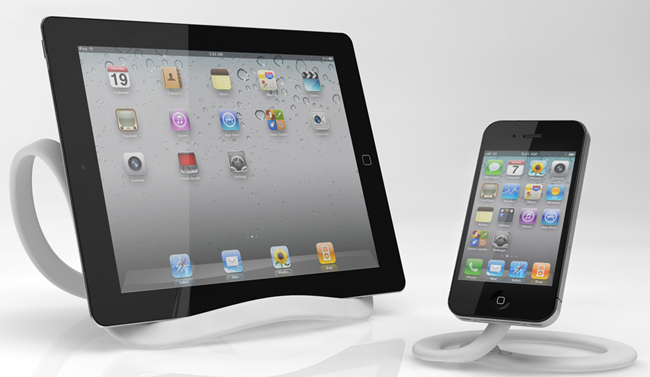 What looks to be the world's most intriguing tablet stand is the InfiniteLoop. The InfiniteLoop is the creation of Tim Gushue, who designed the InfiniteLoop to be the most simplest and versatile tablet stand ever. The patented co-molded metal and plastic form can be easily manipulated to any shape your imagination comes up with while maintaining the strength and rigidity to hold up all sort of heavy tablets like the iPad. What's more, is that there is also the shorter MiniLoop stand made out of the same materials as its older brother, and it too can be manipulated in infinite angles and is compatible with almost any smartphone. The MiniLoop can attach to almost any surface by wrapping it around it, kind of like the flexible Gorillapod tripod. The possibilities and uses of these flexible stands is pretty much endless. The InfiniteLoop is currently a Kickstarter project and you can pre-order the MiniLoop for $19 (will retail for $29.95) while the InfiniteLoop's pre-order price is $35 (will retail for $44.95), plus you'll also get the MiniLoop as a bonus. If you're interested, head over to the InfiniteLoop Kickstarter page for more info. The guys at Infinite Loop hope to start shipping these out by August.